Bottom Bracket: Octalink. Length: 170mm. Let Cervus Bike service you! Colour: Black. With Chain Guard. 2018 Shimano FCTY501 Chainset. Triple Chainset. Alloy 170mm Crank Arms. MTB / TREKKING BIKE. 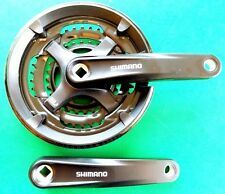 Shimano Triple Chains et. Triple Steel Chainrings. Suggested Bottom bracket: 68x 122.5mm. Will fit a 6 / 7 / 8 Speed, 18 SPEED, 21 SPEED, 24 SPEED. Shimano XTR FC-M950 / 952 Cranks, used and abused, these are certainly a bit rough in the looks department. 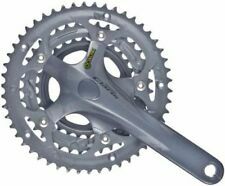 Chainrings are worn but might be of use to someone. 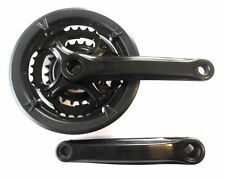 Triple Chainset Chainwheel 28/38/48, 170mm plastic coated steel cranks. Triple Chainset. 170mm Crank Arms. You will receive both sides and crank dust covers. Triple Steel Chainrings. Suggested Bottom bracket: 68x 122.5mm. 44, 32, 22 teeth chainrings. Also, will include the bottom bracket, but the bearings are rough so don`t think it is of any use. (3x9 Speed). 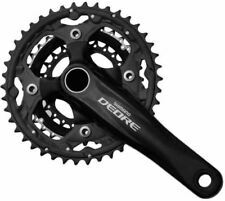 Very good condition retro shimano deore lx triple chainset. Bolts, threads, rings in good shape. Please check images carefully as they form part of the description. 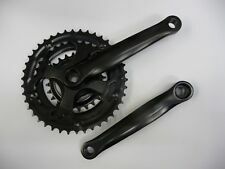 Sugino Retro Cranks Triple 175mm. Condition is Used. Dispatched with Royal Mail 2nd Class. 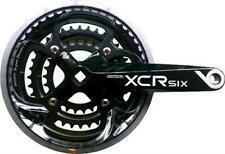 Suntour XCR Mountain Bike Chainset. 22t 32t 44t (cro-mo steel). Alloy crank arms. length 175mm. 8 or 9 speed compatible. 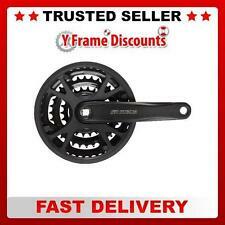 Good quality square taper chainset in good practical condition. Removed from 2000 Kona MTB due to upgrade. Triple Crankset with chain guard. Triple Crankset for square taper bottom bracket. 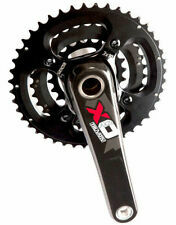 • 170mm crank arms. Sunraces new range are more affordable with out compromising quality.